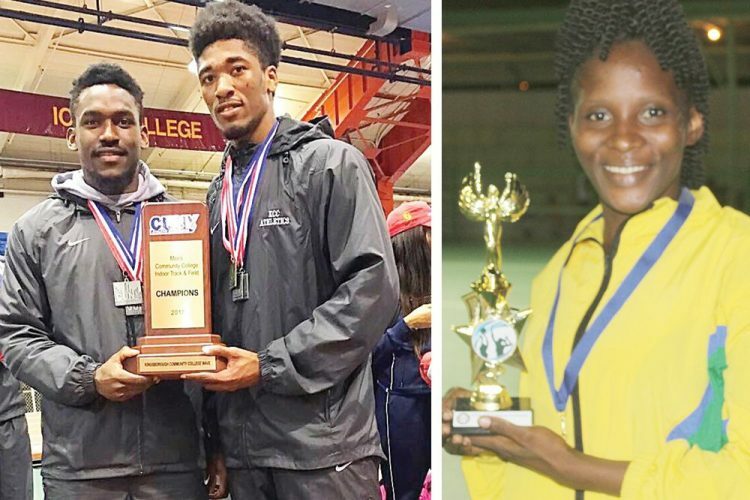 Three Vincentian athletes, Kailon Kirby, Rogike Thorpe and Shantal Rouse, enrolled at the Kingsborough Community College (KCC), are fulfilling their athletics mission at the institution. This, according to the collegeâs director of Athletics Damani Thomas. âWe are teaching him all the different elements to be successful at that eventâ¦Thus far he has proven a quick learner and has the tools necessary for success at the next level…â, Thomas added. Kirbyâs progress has seen the former Thomas Saunders student a part of outstanding efforts, with some coming in the recent past. Earlier this month, Kirby, along with Stephen Cadogan, Malik John and Anija Addison, reset the 4 x 400m record to 3 minutes 17.66 seconds at the Pepsi Florida Relays. Another record-breaking run saw Kirby, Cadogan, Addison and Mauriel Carty bettering the schoolsâ Sprint Medley Relay, when they stopped the clock at 3 minutes 28.95 seconds. Kirby was named the Most Valuable Male Player at the City University of New York (CUNY) Athletics Conferenceâs Community Indoor Championships last February. Kirby won gold in all events he contested at the New Balance Track and Field Center in the Upper West Side of Manhattan. He was the best performer in the Shot Put, with his 9.68m throw and had a leap of 13.79m in the Triple Jump. Kirbyâs Long Jump distance was 6.24m and he shared the High Jump top honours with Hakeem Mowatt, as the two had a height of 1.74m. Kirby showed his all-round skills, as he, along with Kimone Paterson, Ji- Aire Jones and Hakeem Mowatt, timed three minutes 38.20 seconds, to win the 4 x 400m. Meanwhile, Thorpe has been making similar steps towards realizing his potential, according to Thomas. âThorpe has come a long way after sitting out his first year due to a major groin injury we discovered upon arrival. He is beginning to regain confidence now that it is healed. Head coach Dave Loobie and myself expect big things from him going into our championship portion of the season,â Thomas noted. A former student of the Thomas Saunders Secondary, Thorpe was part of a record-breaking quartet at the Pepsi relays earlier this month as well. He, along with Malik John, Maurial Carty and Theodore Westcarr, clocked 41.54 seconds to smash the 4 x 100m record and if that was not enough, they timed 1 minute 26.31 seconds in the 4 x 200m. Like Kirby and Thorpe, Rouse is doing herself justice since enrolling at the KCC last September. In January, she set a new mark in the schoolâs 60m event at an indoor championships. Rouse is a former student of the Bethel High School.